When Philip set out to help me, I wasn’t particularly obliging – he even remarked that I probably hoped he’d fail. He would ask questions: ‘well what makes this wool felt, or shrink more than this one’ or ‘what makes you lay the fibres this way and not that way?’ ‘What does using this particular shampoo with a certain PH do?’ I would respond with either ‘I don’t know…’ or ‘that’s the way I’ve always done it,’ which made me appear as though I had the IQ of a gnat or that I made felt on automatic, not really understanding what I was doing. ‘I do it intuitively! !’ as a response seemed inadequate. I wasn’t even embarrassed about my ignorance. I can’t tell you the amount of times we locked heads because of my stubbornness to try something new, which if you really look at it is not at all ‘creative’. However, my body is broken (yes no longer in denial), and my recovery has been slow. Four years and I still suffer from numbness to both legs, and from night cramps that sometimes keep me up. Something had to give – and it was my attitude. Throwing my felt in the dryer was never an option – because I’m too much of a control freak. 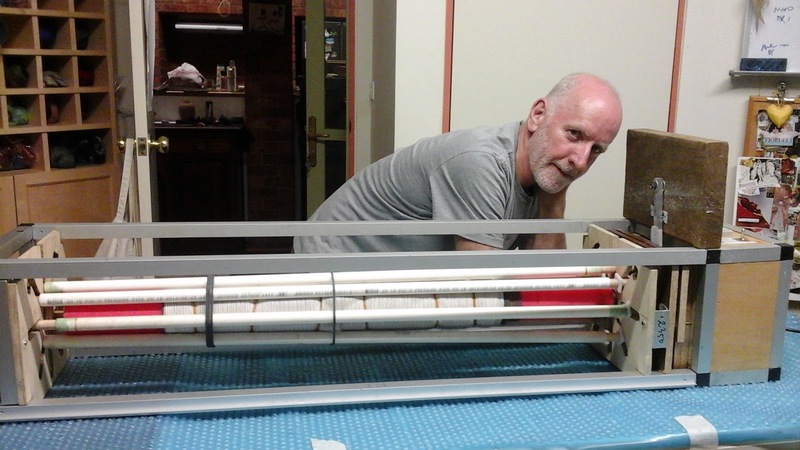 I looked at the Snowy Creek felt roller but thought it too expensive, and I wasn’t convinced that it would help me roll my sort of felt – which is very fine. I like to use merino-silk blends, slippery carrier fabrics, such as old saris, as well as embellishments, such as velvets or gold threads and edges torn from saris – using up the ‘scraps’, which are all so resistant to felting. My coats and jackets require several tens of thousands of rolls before I'm satisfied with the quality of the felt fabric. Philip, with one of the first protoypes. When I made a large production run of scarves, I worked with an assistant, and Philip and the assistant monitored the roller – that’s how unrefined it was at the time. Now I can leave the GR and get on with other things. I don’t have to watch it, neither does anyone else. We’ve come a long way in two years, not least in the way we work together. It’s never been an easy collaboration, as we are chalk and cheese as human beings. And along the way I’ve come to admire and respect Philip’s skills and his determination to make things work, or to try something new – like make felt. I was prepared to give up and try something less back breaking – book-binding, consoling myself with the thought 'you love books'. Never mind that I really like making felt fabric too or that I'd be forsaking a passion. When Philip went to China last time round to finalize the ‘production version’ of the Gentle Roller, I prepared several scarves for him to test out, as I was unable to make the trip with him. We stabilized them with 1000 rolls or so, on a GR prototype, so the scarves could travel. While in China Philip felted the scarves using the roller and the fulling drum, with some instruction from me through Wechat ('How do I know the pre-felt is ready?'... 'I can't see the fibres coming through...' And from my end of the screen it was difficult to judge the pre-felt). The scarves weren’t perfectly done according to my finicky standards, but almost. You can visit Kickstarter to pre-order The Gentle Roller. Below is 'Blooper 5' from our Blooper selection - a window of insight into the Chalk and Cheese every day battle.